Day 8 of my workshop at Studio Escalier in Paris. This is a drawing of a 6-hour pose. Yesterday for the first half I focused on the inner movement curves, the block-in, and finally the detailed contour. Tim and Michelle are teaching us to think of the contour three-dimensionally. So I am thinking of the contour wrapping around the body, moving towards and away from me. We start with the theme, which is the fundamental inner movement curve. The theme starts at the crown of the head, and flows down the center line of the face, down to the big toe of the standing leg, or the leg holding the most weight. The second line we draw (above) is the countertheme - the orange line. It's a secondary inner movement curve that travels from the top of the head, wrapping around the body the opposite direction and down the non-standing leg. Third, we draw the ornament (above). This is the third interrelated movement. As with the theme and countertheme, the ornament wraps around the forms, moving side to side and back to front. Above I've shown how adding more and more interrelated movement curves begins to describe the form. As I get more and more detailed with my contour line, I can see how every form on the body follows this wrapping helix pattern. It's interesting to recreate the curves in Adobe Illustrator. The program creates Bezier curves that have a certain mathematical tensile force, and you have to learn to manipulate them to create flowing curves without awkward bends. The behavior of of Bezier curves is amazingly conducive to the Inner Movement Curves - it was shockingly easy to recreate the curves with the software. I have a feeling there is an implicit relationship between the cohesive, efficient, and functional forms of the body and mathematical curves. Bezier was a 20th century French draftsman! Wikipedia has a great entry on Bezier curves, and near the bottom of the page you can see elegant animations for how Bezier curves are calculated. After spending so much time on the contour, I moved on to the tonal value shading. I was surprised how quickly the value study progressed. 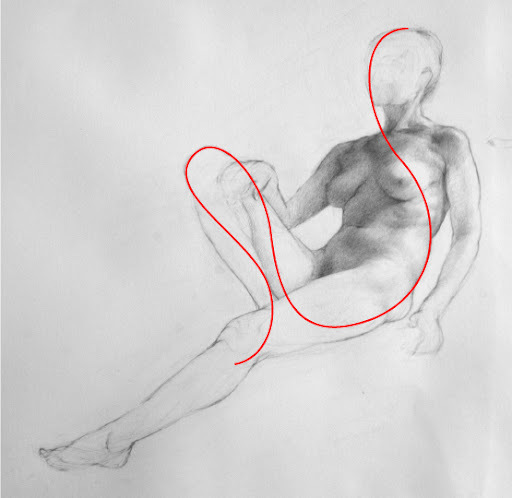 I think learning the contour with this method gives me a deep understanding of the three dimensional figure, so flowing the light across the form is easier. "I think the idea of theme, countertheme and ornament has the power to revolutionize the way you think about the figurative subject, to really marry your eye to your gut to your mind to your hand, and liberate your imagination." These are a couple of my first drawings done at Studio Escalier in Paris this week. Tim Stotz has us focusing on "inner movement curves" to establish the proportions, instead of using the straight-line block in. Also, we are doing 5-minute to 2-hour drawings. Both are very foreign to me after a year if doing 20-40-hour block-in drawings. But it's a good approach for me to practice and I'm enjoying a more responsive and less analytical way to draw.